Preheat the oven to 350ºF. Line a 10x15-inch baking sheet with parchment paper and spray the sides with non-stick baking spray. Liberally sprinkle a thin flour-sack kitchen towel with the 1/4 cup of powdered sugar. This will help prevent the cake from sticking to the towel. In a large bowl, combine the flour, baking powder, baking soda, salt, and spices. In a medium size bowl beat the eggs and sugar with a hand held mixer on medium speed until thick, about 1-2 minutes. Add pumpkin purée and beat until combined. Add flour mixture and beat just until combined. Pour into the prepared baking sheet and spread evenly using an offset spatula. Bake for 13-15 minutes or until the top springs back and the cake has begun to pull away from the sides (If you are using a dark-colored baking sheet, check after 11 minutes). Remove sheet from the oven. Run a pairing knife around the edges of the cake. Carefully invert the cake onto the prepared towel. Gently peel off the parchment paper. Starting at the short end, roll up the cake and the towel together. Place on a wire rack to cool completely. Using a hand-held mixer, beat the cream cheese and butter until combined. Add the vanilla. With the mixer on low, add the powdered sugar and mix until smooth and completely combined. Once the cake is completely cool, carefully unroll the cake. 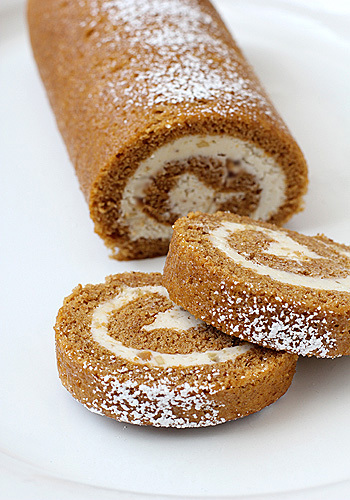 Place the cream cheese mixture down the center of the cake and spread to the sides using an offset spatula. Gently re-roll the cake (without the towel). Wrap in plastic wrap and refrigerate for at least 1 hour. Set the cake out 30 minutes before serving. Dust the top of the cake with additional powdered sugar. Enjoy! Although I'd eat both rolls in each picture I like the first pic the best! But, I'm not picky when it comes to your cooking!! I love the first picture! The roll looks delicious. Your gumbo reminded me of a time long ago when we use to live in Louisiana. On Thanksgiving Day, I would put the turkey carcass in a pot to start making the stock for turkey gumbo right after it was carved, before we even sat down to eat. We always looked forward to turkey gumbo. I love your addition of the sausage. I just might have to pull out that big, old pot again. "Laissez le bon temps rouler!" Like the picture showing the full log. I actually really like both photos! So good choice putting both up! This roll looks so good though, love your additions too! Might be another perfect dessert for our xmas party...its up now to two desserts! Yikes! Gosh sounds like you are a part of my family. I too spent some time down in New Orleans. I do hope you get out that pot and make some gumbo! Thanks for the reply. Choosing the perfect dessert is almost as difficult on planning the whole menu. That is why I like to have options for everyone! I can't wait to see what you try. Your photography is beautiful. I prefer the photo that includes the log, but both are yummy! How far in advance can this be made? You can make this roll up to 3 days in advance, but you can also wrap it tightly in plastic wrap and place in a large freezer bag and freeze it for up to one month. Just thaw it out in the refrigerator before serving. 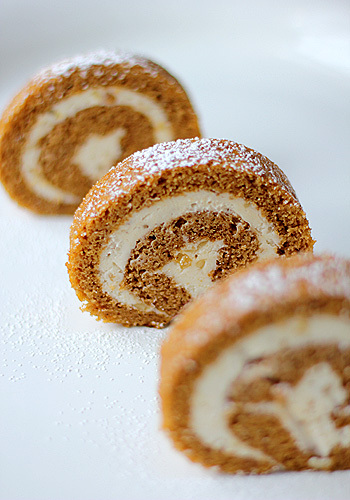 your pumpkin roll looks delish. i made one recently yet it didn't look as pretty as yours! i am excited to recreate for the holidays! After years of making rolls and roulades, I found that the secret is in the towel. No loops (cake sticks to looped kitchen towels), just a plan thin, flour sack towel. And make sure you generously dust the towel with the confectioners sugar. I'm quite a few months late in offering my photo choice opinion but feel compelled to share. Both are lovely, but the one with the three slices line up took my breath away. I love the feeling of movement in that one. This cake is just fantastic, wonderful texture, fun to make, intriguing combination of flavours. I replaced the ginger with finely chopped candied orange peel left from Christmas, perfect combination with the grated walnuts and pumpkin. Thank you for this wonderful recipe!